I can honestly say I am one of those people that dry shampoo was invented for. It is my best friend, my most used beauty product ever, and I love testing out new ones. When I was due to get a new dry shampoo recently I decided to shop around, I have used quite a few in the past but I have never tried the Aussie ones and I decided now was the time! Packaged in a lovely silver aerosol can, and I love the way the Aussie branding looks on the silver can. 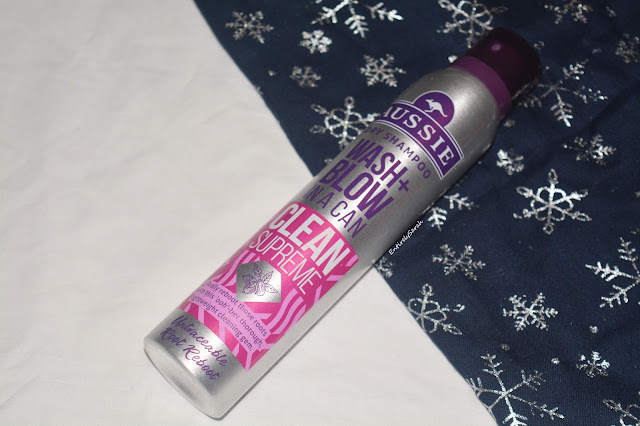 The simple Aussie logo and the theme of the purple running through the logo and the product name gives it a lovely feel and I really like the simplicity of it. The pink of the clean supreme can and the way the logo of this particular one looks, they have colour themes for the other scents and I think it sets the cans off really nicely. The can is thin and tall and you get 180ml of product in. The product doesn't feel gritty or have residue in my hair and so I feel it will be a really comfortable option if you find those types to be agitating in the hair. I feel like you can't tell I have used the dry shampoo when I use this, other than the smell which I will get onto in a minute, but I really think it sits nicely and looks nice in the hair. The scent of this dry shampoo is divine, I find myself wanting to use it all the time just purely for the scent to be lingering around me for the day. This is a very sweet, very bubblegum like scent and I honestly cannot get enough of it! I featured this in my October favourites as I have been loving it so much I can't get it enough. Overall, I think based on the scent, the feel and everything considered this could possibly be my favourite dry shampoo I have ever tried. I cannot explain how much I have been enjoying using this and I definitely have left my hair an extra day over my time off work to use it and enjoy it. I cant wait to test out some of the other scents as I really want to see what they smell like too as they all sound so good! I couldn't find this scent online so I am going to link the other scent I decided between which is the Kool kiwi berry one here, in case you want to see them online. At £4.71 it isn't the cheapest dry shampoo but it is definitely one that is affordable, and while I can't remember what I paid I did buy it on offer a few weeks back. Let me know if you have tried this, or what your go to hair product is at the minute as I love finding out and trying new things!